Peucedanum japonicum on Yonaguni Island. The volume of production is increasing of peucedanum japonicum, or the longevity herb, a Yonaguni Island herb long known to have medicinal properties. From 2005 to 2010, annual production in Okinawa has grown 8.1 times to 26.6 tons, and the area harvested has increased 4.5 times to 25.4 hectares. In the background to this sharp rise is the fact that Yonaguni, which supplies 95% of the production in Okinawa, developed its production system thanks to budget provided by the national government and the fact that they have made the herb available as a raw material to Shiseido, a major cosmetics company in Tokyo. It is expected that following on from turmeric and aloe, the herb will go on to become another significant medicinal crop for Okinawa. In 2005, hoping to become a production hub for prefectural-certified agricultural, forestry and fisheries items, the Yonaguni local authorities established a production area council for peucedanum japonicum comprising local government officials, farmers and members of the Japan Agricultural Cooperatives. This has served to strengthen links among producers, manufacturers and distributors and status as a prefectural-certified area of hub production was granted in 2006. The annual production volume in Okinawa of the peucedanum japonicum and the area harvested. 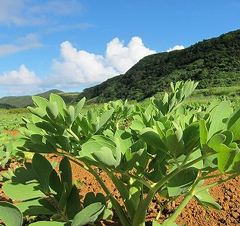 In 2010, they set up a producer-manufacturer’s agricultural group called the Yonaguni Herb Farm using the national fund for revitalizing mountain, agricultural and fishing communities, and launched the Yonaguni Producer Association for peucedanum japonicum. These activities all combined to help establish a stable production system. 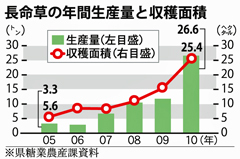 As a result, the annual production of the herb in Okinawa in 2005 of 3.3 tons had increased to 26.6 tons by 2010. The area harvested also surged from 5.6 hectares to 25.4 hectares and production is now approaching the 2009 levels of the other medicinal crops in Okinawa of turmeric, 55.1 tons, and aloe, 34.2 tons. Shiseido is marketing health foods made solely from Yonaguni’s peucedanum japonicum as the Shiseido Longevity Herb in the three forms of tablets, a drink and a powder. Sales from this April to June increased about 40% over the same period the previous year. They decided upon the production volume after discussing the quantity needed each year with the council, thereby helping to secure a stable income for the local farmers. During fiscal 2005 to 2011, the number of farmers in Yonaguni also grew by 13 families to a total of 50 families and the production value grew by about 2.5 million yen to about 33.1 million yen.